The "Endogate Papers" dissected for easy reading! Starting tomorrow the "Endogate Papers "will be posted in segments for easy reading! Questions, concerns, findings, and issues pertaining to Endogyn, Emma Clinic, Kruschinski, the " Abdolift," as well as "Kru's" groupies, will offer the readers information that will allow them to make an informed decision as to seeking surgical intervention at Endogyn. Names will be named as there are no secrets on IHRT! These papers are for those who are seeking truth, so if you think IHRT is filled with lies and is only out to "destroy" Kru, as he claims, don't read them, go ahead and schedule your surgery with him, as soon enough you will be paging through every bit of IHRT where it pertains to Endogyn! Though these papers contain only what we knew when they were written, IHRT has now learned MORE information from patients to Endogyn who have shared their horrifying experiences behind the doors of, " Endogyn!" Stay tuned. Thank-YOU Karen Steward for IHRT's purpose to continue! Now, having said that, it is my intention to bring up each and every issue that IHRT has regarding Endogyn and Kruschinski, the Abdolift and his web site. This is a must do as it is obviouse to IHRT that Karen Steward will not allow former patients to Endogyn the opportunity to bring thier issues forward, instead, she "smoke screens" the issues by creating an hostile environment, and as ussual, turns the issues to something else, like personal attacks on others, lots of anger and accusations that are not warrented at all and certainly NOT instigated by the poor patient trying to deal with their issues regarding Endogyn! Karen, and others, intercept questions posed to "Kru" and accuse those who dare post anything but praise to "Kru" as being evil and nasty, yet at the same time, Karen behavior towards the patient are the same things SHE is accusing the patient of doing, and much worse, as she incites others too "whip" these poor patients into submission, of sorts! Because of this limited opportunity for past patients to Endogyn to ask "real" questions they have, or to bring THIER concerns to "Kru" on his own board, IHRT will simply continue to point the many concerns and issues that surround Endogyn and grow more everyday as past patients TRY to secure some answers from "Kru," but cannot! Again, thank-YOU, Karen for IHRT's purpose to continue! No gloves in the examining room? Though my name is being used once again by Karen and Daniel in an attempt to discredit a former patient of his, I am not writing, initiating or instigating this former patient to ask her questions or bring her concerns to Endogyn message board. I have never been a patient to Endogyn, I do not care who secures a surgery at Endogyn, never did care and why should I care, the answer is that I do not care at all! The team at IHRT welcomes and apprciates all those who have posted thier comments and concerns in IHRT! This is so important as your sharing the truth of your experiences at Endogyn, others might be spared the same fate! You trusted those who were not honest, still aren't as recent as yesterday's posts in Endogyn, but the sharing of your pain and continuing suffering might tip the scales in favor of saving anothers life! Shocking information to come! IHRT investigates and reports on the "International Patient Contact List" in Endogyn, and LOTS more information regarding the contents of the Endogyn web site! I am looking for information from pts. who have remained improved after 1-2 years after the first trip to Germany, and persons who secured sustained improvements from a second trip to Germany that was at least one year ago. Click on "comments" if you wish to comment. "Jed" is on target asking good questions! IHRT STRONGLY suggests that anyone considering a surgery at Endogyn ask lots of questions of the surgeon, as the "patient contact" list is most deceiving and cannot be trusted to offer factual information to prospective patients! This gibberish about "10% stuff" is just that, "stuff!" There exists not a drop of evidence anywhere to substantiate such nonsense! Scientific or otherwise! Look into the "International Patient" contact list, more then 10% of those patients to Endogyn that are listed there have either returned for multiple surgeries, (which are NOT logged in the Endogyn site by the way), have changed thier contact information or, those being honest enough, will share that they are simply not well, nor are the family members whom they post for or speak of. Based on the International Contact list in Endogyn, it would appear that less then 10% of "Kruchinsk's" surgical patients MIGHT have secured reduction of presenting symptoms that existed prior to going to Endogyn, (however, if these patients do exists, where are they?) The other 90+%, appear to be as bad or worse for the trip! IHRT counts those who do not post or have removed thier contact information from Endogyn, or changed it, among the 90+% of those who are not well for the trip to Endogyn. Kruschisnki sending an " Easter Greeting" to his patients after he put up a picture in his Endogyn web site "mocking" Jesus Christ? Take this greeting for what it really is, another way to show himself off as something he is not in hopes of getting patients to like and trust him! In sad realiity, this is just an empty message sent to manipulate vulnerable, desperate patients into coming to Endogyn for adhesiolysis, and in the lowest form yet! Beware of ANY messages from him as recently, Kruschinski mocked the picture representation of "Jesus being a member of his surgical team," stating that no patient could depend on Jesus for a cure, but they could depend on Kruchsinksi for a cure! Of course he removed this mockery as soon as IHRT pointed it out but he will never be able to erase the "message" he sent for all to see, no faith in his operating room allowed! including the arrogant LOL part. A mockery of the faith of so many. Dr Kruschinski of Endogyn, Emma Klinik in Frankfurt is decreasing it's surgical procedures there! New Centers in Germany Opening for the European Patients! USA patients to Kruschinski can now go to the Grand Caymans! Is this facility going to offer "gasless only"? Kruschinski stress's that CO2 will cause adhesions, and no one wants that when seeking a surgery to get rid of adhesions! Imagine of adhesion from Abdolift found at third look surgery! This issue would seem important to mention IF this were a real promotion! Will Kruschinski be doing the surgeries at these two facilities or will patients be paying for two surgeons in Braunschweig & Hanover? Beware of this claim as they seem to crop up after IHRT mentions these surgeons lack of association with Kruschinski! After bringing what appeareds to be a lack of "association" between Kruschinski and "his team," to the public right here in IHRT, we find Kruschinski all of a sudden opening a facility with Goeshen because they have a "close cooperation!" ...and like the Caymans, the "infrastructure" will be fashioned after Endogyn, Emma Klinik! Next IHRT will find Kruschinski opening a surgical center with Mettler, and that one will also be established in the same way as in the Emma Klinik and through a the close ccoperation with her as well. Interesting is that Kruschinski never mentioned these "team" players doing anything with him for the past three years! IHRT wonders what, "close cooperation" means to Kruschinski! IHRT asks if these "New EndoGyn Centers" being "announced" on a posting board for ARD patients is the ONLY place where they are being announced? What kind of business's announce NEW Medical Centers on a posting board?? Is Goeshen as "cheesy" as Kruschinski to think that anyone would see this as a true announcement of a surgical center?? (These NEW centers are NOT mentioned in the "New Locations" section in Endogyn web site! "Our international reputation allows us to expand, as many patients, especially from Europe are seeking surgery with us." IHRT could not agree more with this statement by Kruschinski, ( true or false) as he is implying that patients from the USA will not benefit from these new centers, but rather in the Grand Caymans if thier needs are to be served in thier best interest! Posted Thursday, April 13, 2006 @ 00:47 AM EndoGyn announces the opening of two additional EndoGyn centers, which occured through the close ccoperation with Prof. Goeschen. http://www.endogyn.de/index.php?seite=endogyn&sprache=en&a=EndoGyn&b=Physicians&c=ProfGoeschen&session=aOgt1RXkoP8pp2PDvkaVFd1guR, one of our team collegues. Hannover and Braunschweig are both very close to the international airport in Hannover. while Braunschweig is a lovely old city with beautifull architecture. EndoGyn is establishing centers in the same way as in the Emma - Klinik, on a external surgeons basis with external offices (out of the hospital) with the possibility of treating patients there. Our international reputation allows us to expand, as many patients, especially from Europe are seeking surgery with us. Adhesion Related Disorder International Human Rights Team IHRT: NO MORE Endogyn for Patients from the USA!! NEWS FLASH - JUST IN to IHRT! Here we have Kruschinski "exploiting" his patients once again, and for all the world to see! He is so egotistical in this area of disrespect for his patients, that he intends to post Linda's information again! But one can never trust that information posted by Kruschinski is fact or fiction as it is simply an "advertisement", a poor one at that! Krushinski has no scruples when it comes to using his patients as "advertising" for Endogyn! This method of "advertising" beats paying for it and as long as you have no respect for anyone, use them for free. Totally tacky, unlike here in the USA where respect, responsibility and confidentiality are a part of our medical system. When securing a surgery at Endogyn, these things are out the window! Please note that IHRT is saying that patients are "exploited" at Endogyn, as this does not occur at any other hospital in Europe! Shame on you Daniel Kruschinski for NOT holding in confidence your patients personal information and for "exploiting" these poor desperate and vulnerable people for your personal gain! The "Touchy Feely" letter between Reich and Daniel Kruschinski...fails it's intended goal! Now THIS is the most pathetic (and funny) attempt to show that Daniel has an "alliance" or "friendship" with Dr. Harry Reich! It has been VERY obvious to all who have ever visited the Endogyn web site that Daniel has been standing on Dr. Reich's laurels when it comes to dealing with adhesion issues as he doesn't have any of his own to stand on, so of course when the truth be told that Reich has NOT been performing adhesiolysis procedures at Endogyn, and that Kruschinski WAS/IS intercepting the emails sent to the "OTHER" surgeons on the Endogyn "team," he scrambles and whines to Reich, who then writes another letter making it appear that all is well, has been well and will be well, "between" them! Notice how Daniel didn't bother to secure a letter from Mettler or Goeshen?? They are NOT as well known as Reich is, so if your looking to fill your pocket book and your doing it by capitalizing on a "friend," use the one with the big guns! Daniel's a real "weasel" when it comes to manipulation, however, he forgets that not everyone is a "Stupid American Women" and with recall no less! Surprise Daniel, this maneuver didn't work and this letter between Reich and Daniel Kruschinski is their personal business. If Reich wants to listen to Daniel whine, so be it, but they would be wise to can keep it between themselves as it only offered validation of how desperate and needy Daniel really is when it comes to finding anyone or anything that will say he is anything but a scoundrel! "I have never encouraged anyone to abuse you and your efforts for adhesion patients on other web sites." Oh Paaleeezee, Daniel, grow up! What a whiney guy. Whaaaa! One letter will not eradicate the seeds you have sowed. IHRT's opinion on this letter from Reich is that Reich is either oblivious to the facts of poor surgeries being performed at Endogyn and the miss-representation by Daniel to patients when luring them into his operating room, nor how often Daniel distorts truths, offers no credentials of validations of his claims of research, even going as far as to use Reich's name on a paper he and his wife wrote, and not one single word in it FROM Reich, but only made to appear as if Reich was involved in writing it!! Maybe Reich doesn't realise that Daniel is dishonest, a liar, and treats his patients terrible, none the less, until Reich has a surgery on himself by Daniel, he can keep his opinions about Daniel's capabilities to himself! IHRT also wonders why in the world Reich OR Daniel Kruschinski think any patient would buy this crap knowing how Kruschinski feels about Reich's abilities and techniques. Come on, give us a break here! This letter doesn't do a thing to reverse what has been uncovered in Endogyn, instead, it confirms Daniel's NEED to be able to be aligned with Reich if Endogyn is to secure ARD patients there for a surgery! People observing Endogyn has seen this scenario before. The heat is on, unanswered questions, all manner of thuggery, then a letter trying to make Daniel out as something he is not...been there, done that, and nothing produced back then! Why would a prospective adhesion patient coming to Endogyn care if Reich is there or not, as Reich uses CO2 in his surgery. IHRT is well aware that Daniel "Knows" and has "Proven" that CO2 causes adhesions! Does Daniel want patients to get more adhesions? Does Daniel want patients to have an adhesiolysis that is "known" to cause adhesions? He, himself, states it over and over in his web site! Why would Daniel want Reich, or anyone else performing adhesiolysis at Endogyn, he himself states that he alone is the best! Now the Cayman's are going to reorganize it's "infrastructure" to parallel Endogyn's! IHRT wonders what Emma Klinik thinks of this competition of routing the international patients promised to Emma Klinik now being routed to the Caymans by Daniel!! This letter appears to show that Daniel must feel that he, himself, cannot offer patients what they need when coming to Endogyn, unless Reich is there! IHRT agrees that unless Reich is at Endogyn performing adhesiolysis procedures, there is no need to go to Endogyn for an adhesiolysis! Being that Daniel appears to NEED Reich in order to appear to be running an efficient and effective facility offering high quality adhesiolysis procedures, then maybe, just maybe, all that gibberish about the CO2 ISN'T fact, but instead, bogus information like most of the material in Endogyn! It also appears that the adhesiolysis procedures at Endogyn did not offer a high quality procedure under Daniel, thus the reason for 3rd, 4th, 5th & 6th return trips and multiple procedures being done by him with but a few securing any relief in their symptoms. Daniel IS dedicated to ARD issues all right, this appears to be very true, and he has performed surgery, for his research that is, on ARD patients, and plastic surgery too, and making money all the while he practices in his area of interest, which appears to be focused on ARD, which encompasses a group of desperate, vulnerable and very ill people easily exploited for his "dedicated" area of interest! If ARD patients want a high quality adhesiolysis with SprayGel and an experienced surgeon, such as Reich, they can go to the Caymans! If they want a "Gasless: adhesiolysis with SprayGel, and performed by someone like Daniel, they are best served to go to the Caymans where they will be able to secure a video of the surgery, have capable surgeons present and observing, and have far less hassle with International issues such as they face in a trip, or trips, to Endogyn in Germany! This letter was, "sweet," a nice try by Reich but what Reich doesn't seem to know is that there is far too much dirty water, validated at that. his kindness was exploited, unknowingly to get Daniel afloat once again! ...But all the allegations of henious, unproven, botched surgeries, bogus science and credentials, his franchising plans, his search for investors, you know... all matter Endogyn. Daniel is NOT a skilled surgeon, NOT an honest person, NOT complimentary of any other surgical technique but his own. NOT open to work with other surgeons, NOT respectful of his patients or Emma Klinik for that matter. Daniel Kruschinski goes far beyond a "normal" Dr. patient relationship! It is nice that Daniel is "hosting" an ISGE meeting in 2007, he needs stuff like this to boost his self esteem, and feel like he is accomplishing something, as to date, he has failed miserably when it comes to issue related to ARD! Daniel IS capitalizing on this for sure. This should be a milestone in the treatment of adhesion related disorders." IHRT hopes this will be the truth, and it just might be, but NOT because Daniel is there!!! Dr. Reich, ARD patient's have lost faith in Dr Kruchinski a long time ago! IHRT is watching the relocation of Endogyn, the "Abdolift"hook and Daniel to the Caymans. We support that move 100%. IHRT is also waiting for the "abstracts" promised by Daniel to be coming out soon. IHRT is waiting on statistics, reports and research on the claims of CO2 causing adhesions. IHRT is waiting for the research stating why "gasless" is better then CO2 for adhesiolysis. IHRT is waiting for an explanation why Daniel is saying that a "laporoscopic" surgery causes adhesions. IHRT is still waiting on an explanation of why the SprayGel doesn't seem to be working at Endogyn for adhesion surgery by Kruschinski! "Here you see how important it is to have the back-door opportunity of a 3rd-look laparoscopy. An adhesion formed to the umbilical incision of the second-look laparoscopy, and there is no way to avoid or exclude this as it is the last port that is open after we finish surgery, and this is still a very small wounded area with a minimal blood area where adhesions can form. After we take this adhesion down, the patient might become pain free." Maybe Reich can answer these questions for Daniel, and for all of us! IHRT remains committed to telling the truths in the world of ARD! IHRT remains committed and will never be silenced! Personal email from Dr. Harry Reich ! Gender: Male Location: Registered: Jul 2003 Status: Offline Posts: 265 Posted Saturday, April 8, 2006 @ 01:19 AM An Daniel.Kruschinski@Endogyn.com Betreff Re: (no subject) Erhalten 08.04.06, 00:35 Daniel Kruschinski You may post this email on your message board. As you know, I believe that good surgery results in less adhesions, regardless of whether the surgeon uses CO2 pneumoperitoneum (gas) or air (gasless). And you are a good surgeon. As we know, adhesion surgery can be frustrating surgery for both doctor and patient. You are one of the very few doctors dedicated to the research of ARD and the surgical options of treatment. I have never encouraged anyone to abuse you and your efforts for adhesion patients on other web sites. 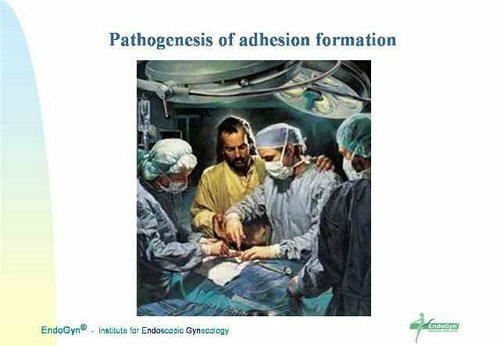 Patients visiting the web sites of Adhesions.de and EndoGyn.com should be very confident about your efforts to help ARD patients. Your technique of gasless laparoscopy seems to have good results. You are an excellent adhesion surgeon and have a great infrastructure for ARD patients at your EndoGyn facility. I have referred patients to you. I look forward to your organization of a very special congress on adhesions in 2007 for the International Society for Endoscopic Gynecology (ISGE). This should be a milestone in the treatment of adhesion related disorders. I hope to perform more surgery at EndoGyn in the near future. Let us continue our very special cooperation. Dr Kruschinski (Chameleon) and his "Word"
Dr Kruschinski claims that carbon dioxide (CO2) for laparoscopic surgery causes detrimental adhesion formation. for laparoscopic surgery using CO2 gas. This gives surgeons an excellent visual field to work in. Dr Kruschinski claims the abdolift is the solution to this perceived problem of adhesion formation from CO2 by using this abdominal wall lifting device (rather like a human corkscrew). To me it looks like it tents the abdomen when in use. Many surgeons who have published scientific papers, held up to the scrutiny of their peers, claim that the surgeons visual field is compromised by abdominal wall lifts. Dr Kruschinski claims to be it's inventor. He writes often of a dream to franchise his Endogyn business model and the abdolift plays a major role in the selling of this concept. So there is allot more on the line than just helping relieve the suffering of an adhesion patient. A budding new business, perhaps visions of a Mc Donalds like empire....just something to keep in the back of your mind. Dr Kru claims to have the best success rate of any surgeon performing an adhesiolysis. Claims of 100% adhesion free patient at second look surgery are very enticing indeed. We hear it over an over again. provided to patients. You will just have to take "his word" for that I guess. Lets take a look at some of Daniel's own words. Draw your own conclusion as to weather you can rely on statements made by Dr. Kruschinski if you are investigating an adhesiolysis intervention with infamous Dr. K.
In just the few exerts below it seems pretty clear to me he'll say ANYTHING to get you to agree to a surgery with him. No real facts, no scientific proof. Dr Kruschinski: Here you see how important it is to have the back-door opportunity of a 3rd-look laparoscopy. 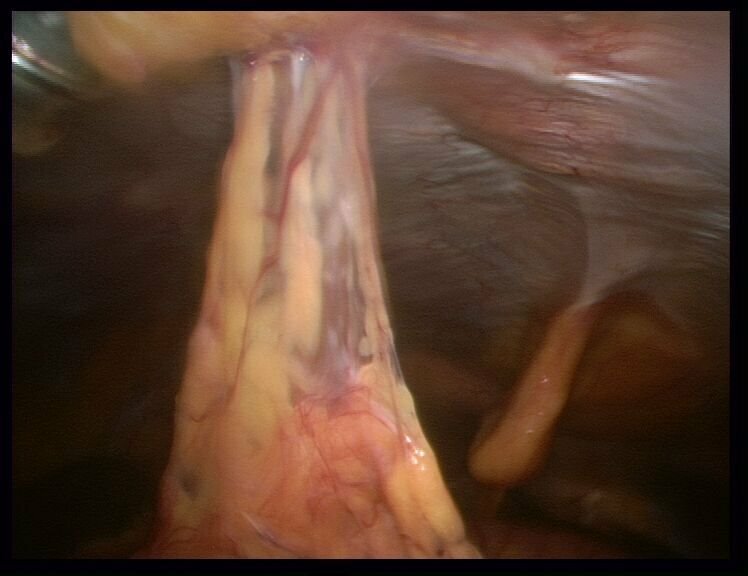 An adhesion formed to the umbilical incision of the second-look laparoscopy, and there is no way to avoid or exclude this as it is the last port that is open after we finish surgery, and this is still a very small wounded area with a minimal blood area where adhesions can form. This looks like a pretty nasty adhesion to me! 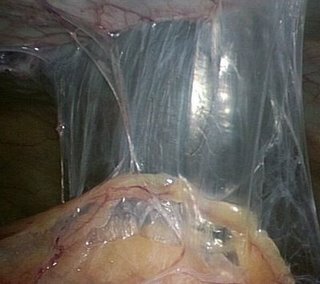 Picture of an adhesion from last port of abdolift at one of Dr. Daniel Kruschinski's 3rd look surgeries. What's to stop this type of adhesion from the closing port from occurring again and again? Do you truly want to get more money to go back to Germany to have this adhesion taken down. You will if you buy into Daniels carbon dioxide theory. How can this be a solution for adhesion sufferers? Why would this be any different than any surgery you have secured before? You will not be offered a DVD of your surgery. Back to the validity of Daniel's "word". Dr Kruschinski: "And here you can see that even if using the best adhesion barrier available (SprayGel), but WITH carbon dioxide, adhesiolysis surgery is in most cases USELESS." Dr. Kruschinski: With my friend Harry Reich, we have very frequent fruitful discussions about gas and gasless surgery. And I am sure that we need another 15 years of research and clinical data to show which technique might be better. I am a former patient and you can take my word for it that there is big time scamming going on. I don't expect anyone to take my word for anything. We are on the internt after all. We can be anything we want to be in cyberspace. I offer more than just words, my operative reports. My surgery in Boston where I have chronic stage 4 endometriosis and adhesions. My two surgeries with Daniel, I;m cured, I am adhesion free, I NEVER had endo. Two month post surg from germany I am desparate again. A few months later I am angel flighted to surgeons here in the US and post surgical diagnosis of that surgery reveals chronic endometriosis and dense even calcified adhesions. Is going back again and again all part of Dr. Kruschinski's lucrative business plan? I urge you to consider this. I also urge you to avoid emotional and anecdotal information on the godlike greatness, of Danial by his 'Patient advocates". Get Daniel and Daniel alone to answer your questions then check them against his writings in his endogyn website. You really need alot more than just the words of some man on the internet. This is life or death. Perhaps things even worse than death. May god be with you in your walk. Only you can decide whats right for you. ...you were a victim of an very easy and deliberate scam to get your money! IHRT....IT IS AGAINST THE LAW to use the Internet to offer goods not produced on!!! IHRT understands that a number of patients to "Endogyn, Emma Klinic" went there based on "words and accolades" of others via the internet expressing their "opinions" of Daniels "congeniality "& "fast email response to patients as " compassionate" responses by him," and by information that "appeared" to be statistics of adhesiolysis procedures done there, and that some surgeries were scheduled without actually checking into Daniels "credentials" or actually securing any validations of the "statistics" being presented by some of his "groupies." you were a victim of an very easy and deliberate scam to get your money! What makes IHRT any different then Endogyn when it comes to what we are saying about adhesiolysis at Endogyn, Emma Klinik & Daniel Kruschinski..well, for the most part, what IHRT is doing is simply responding to the words of Daniel, himself, and those who post for him. IHRT offers there opinion on issues already posted by Daniel, IHRT asks questions of Daniel and others representing Endogyn, Emma Klinic, and IHRT posts what has already been posted by Daniel and others at Endogyn, Emma Klinic, and we do this as it is absolutely imperative that the message of what REALLY exists at Endogyn, Emma Klinic, gets out to all who are afflicted with ARD and vulnerable to empty promises and a future of hell.Take a look at how easy it is for someone to only show only a small part of the studies dealing with this issue, and this study did not focus on "DeNovo" adhesions (new adhesions) caused by the lapororotmy incision, or Abdolift "Das Hook" entry port, if you will! Laporoscopy vs LaporotomyFertil Steril. 1991 Oct;56(4):792. Postoperative adhesion development after operative laparoscopy: evaluation at early second-look procedures. Remember, there are always two side to each story, just like you see here. IHRT invites Daniel to come on into IHRT and clarify, denounce, or agree with anything we have stated about Endogyn, Emma Klinic, or about Daniel himself witn the pages of IHRT! Common sense tells us that we should have checked this stuff out before taking others words on it...and that if it sounds to good to be true, then it probably is, but IHRT wants to remind you that those afflicted with chronic, disabling, painful and seemingly hopeless illness's, are easy prey to those who elect to take advantage of them for money! What makes IHRT any different then Endogyn when it comes to what we are saying about adhesiolysis at Endogyn, Emma Klinik & Daniel Kruschinski..well, for the most part, what IHRT is doing is simply responding to the words of Daniel, himself, and those who post for him. IHRT offers there opinion on issues already posted by Daniel, IHRT asks questions of Daniel and others representing Endogyn, Emma Klinic, and IHRT posts what has already been posted by Daniel and others at Endogyn, Emma Klinic, and we do this as it is absolutely imperative that the message of what REALLY exists at Endogyn, Emma Klinic, gets out to all who are afflicted with ARD and vulnerable to empty promises and a future of hell!It is words like this from Daniels mouth that entices desperate ARD sufferers to his operating room..and he miss-represented the article he focused on in his attempts to discredit laporoscopic surgery, which is what HE does, isn't it???! *** IHRT contacted the FBI, where they encourage any prior patients to Endogyn, Emma Klinic, to go to this web site and fill out a formal complaint against Daniel, if they feel that Daniel "extracted" money from them under "false" promises and pretenses! State that other complaints have been submitted against Endogyn, Emma Klinic, and remember, the more complaints filed, the better your case to re-cup money extracted from you by Daniel!" ***IHRT contacted the "Federal Trade Commission" where they encourage any prior patients to Endogyn, Emma Klinic, to CALL the number listed here to file a formal complaint against Daniel, if they feel that Daniel "extracted" money from them under "false" promises and pretenses! State that other complaints have been submitted against Endogyn, Emma Klinic, and remember, the more complaints filed, the better your case to re-cup money extracted from you by Daniel! IHRT is offering patients from Endogyn, Emma Klinic the opportunity to recoup moneys spent there particularly if a prior patient went to Enodgyn, Emma Klinic and does not think that they received services promised to them! D.) Offering surgery at Endogyn with Harry Reich, of the USA, only to find that Dr. Reich has only performed 4 surgeries at Endogyn,Emma Klinic in four years! 4.) sharing statistics with you that appeared to be "to good to be true." If anyone one who wants to file a report with the "FBI and Federal Trade Commission," but are not sure if you quality, please ask your question through IHRT response to this post, using "Anonymous," and we will offer our advice and/or direct you to where you can secure your answers. Recent studies have estimated that nearly 40 percent of the people who use the Internet are seeking medical information. With consumers wanting to become more informed and in control of their health care, this should come as little surprise. Research done in minutes on the Internet replaces days of searching volumes of medical journals. Not only are consumers turning to the Internet for information on illnesses and an array of medical advice, but many look to chat sessions and on-line support groups to provide emotional support. It would seem that this technology has the potential to cure all that ails the medical information seeker, but it is not quite that cut-and-dried. Those surfing the Web should do so with a critical eye. The problem with searching the World Wide Web is not finding too little information, but finding accurate and complete information. It can be hard to separate fact from fiction, medical opinion from sound medical knowledge. Do YOU think that YOU were used as a “research” patient for Daniel’s studies?You better ask him as if you weren’t, who was? ?If patients were not told that they were part of a “study and research” of a surgery, that is as “unethical” in Germany as it is here in the USA and must be reported!! IHRT says: NOW Daniel tells us!!!  NOW he tells us that things are not quite what he portrayed them to be?  Daniel used the above information to promote HIS gasless surgery, yet some of these are “miss-represented” to reflect what Daniel wants them to reflect! IHRT knows this as we have the “actual” reports to compare how Daniel used them!  Patients traveled to Endogyn believed in this stuff…who could have known!!?  If it will take 15 years “of research and clinical data to show which technique might be better” which patients HAVE been and WILL be used for these studies for his “research”?  DID Daniel tell any of his patients that his adhesiolysis procedure is NOT tested as to whether it could offer anything better then any other adhesiolysis!  He IS telling them that NOW!  If your all of a suddenly ill from reading this, better go to the FBI & FTC to get your money back!!
" Just Say No to Thugs"